The latest ING International Survey provides fascinating insights into the changing nature of global payments: 61% of European smartphone owners use the device to bank, up from 48% in 2017. 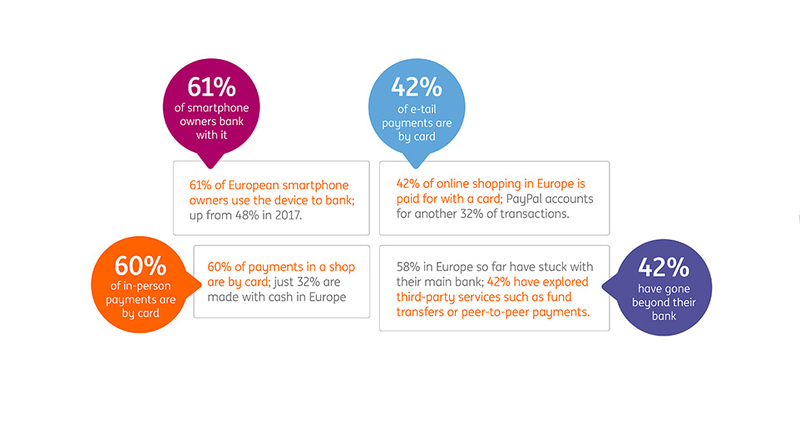 42% of online shopping in Europe is paid for with a card. And while 58% of people in Europe have so far stuck with their main bank, 42% have explored third-party services such as fund transfers or peer-to-peer payments. Clearly, the digital movement isn’t stopping, with more people owning mobile devices and larger percentages using them for aspects of personal banking. Two in five (39%) people across Europe are shopping online at least once per month and in the UK 16% are shopping at least once per week. Of those choosing not to shop online, interestingly the importance of physically trying clothes on and the social element of going shopping with friends were important, as well as concerns about the security of making online payments. Those worries are not an issue for all, with PayPal and stored card information being the largest portions of online transaction methods. With stored information people no longer have to spend time and effort providing information to verify a payment, taking out much of the pain of paying. A convenience which while attractive can perhaps lead us to spend more than we might intend. In the future people expect to be further adopting technological ways to pay both online and in-store, with 11% of people saying they’ll take up banking on their smartphone in the next 12 months. But we also asked which ways to pay people would never use in the future and saw that perhaps unsurprisingly we are least likely to adopt those we aren’t already familiar with or which don’t already have some connotation with money. The smallest group said they would never use PayPal, while the second smallest group said they would never use their bank’s app. People’s trust in products and services that come from their traditional bank is a trend we see consistently across a range of questions and topics. Interestingly Germany has one of the highest cases of cash use suggesting a resistance to moving online, while respondents in Turkey were less likely to say they only used their traditional bank when it came to engaging financial services, suggesting support for change within their management of personal finances online. These differences contribute to the variation in online payment choices we see between countries. While our options for paying in-store are relatively straightforward, cash, debit or credit card, the choices when making online transactions are much broader. And they vary across countries, technologies and attitudes. In the Netherlands interbank transfer options such as iDeal are most popular and in a range of European countries such as France, Austria and Germany, Klarna and Boon are alternative methods present. 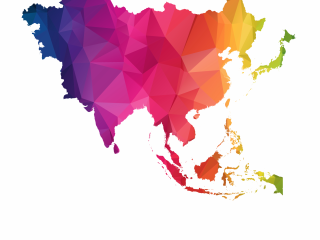 In total, we asked the 15 countries within our survey about 22 different online payment options, including global fintechs, local fintechs, interbank solutions and the global giants, Amazon, Google and Apple Pay. This large list shows just how many options people have when it comes to making payments online; it's an opportunity to design their own digital experience. While some people (42%) are moving to alternative service providers for a selection of their personal banking needs, many are also choosing to stick with their traditional bank for all of their financial needs. Those dabbling with substitute providers were more likely to be male, employed, married or divorced, educated, earning more and already often shopping online. So while it is clear that banking on the go is becoming more popular, some remain sceptical or hesitant to jump on the bandwagon. We can only speculate on the exact saturation point for mobile banking but for a market rife with options when it comes to managing our personal finances, it's clearly an important, increasing trend we'll be monitoring closely. At ING, we are interested in how people think about money, the personal side of finance. And to better understand how we go about making financial decisions we ask lots of questions. From have you heard of Cryptocurrency, to do you discuss money with your partner? And from these questions, we develop insights into trends within the personal finance space. In our latest research, we asked people how they pay both online and in-store, and whether they have reached outside their traditional bank to other service providers when it comes to managing their money.